The banking industry represented by leading UNEP FI member banks worldwide have set out to develop global Principles for Responsible Banking that will define the banking industry’s role and responsibilities in aligning financing with the UN Sustainable Development Goals and Paris Agreement on Climate Change to help shape a sustainable future. 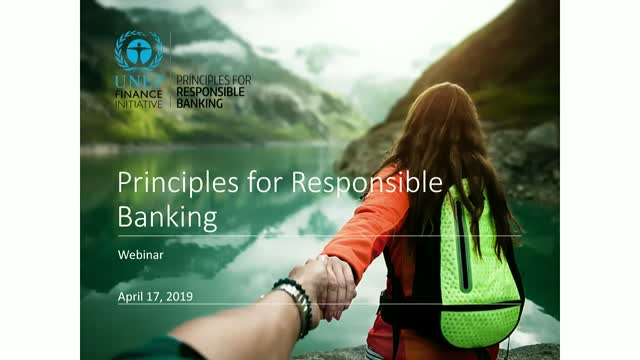 UNEP FI and the Founding Banks will be hosting an informative webinar to present and explain the Principles for Responsible Banking, including their target-setting and accountability requirements, and to get your feedback. Energy efficiency is one of the most concrete actions financial institutions can take to advance their sustainability performance and tap into the trillions of USD of energy inefficient assets. It is also increasingly on the radar of financial regulators as they consider an adjustment of capital adequacy requirements for certain types of energy efficient financial products. Real estate, which is the largest source of global stored wealth, is strongly affected by energy efficiency. With more than 230 billion USD of new investment every year, energy efficiency is almost as large a market as renewable energy. The UNEP FI Energy Efficiency Finance Platform will provide for an exchange of information between financial institutions across banking, investment and insurance and across distinct economic sectors such as real estate and industry. It builds on and is synergetic with existing UNEP FI projects in scaling up energy efficiency finance, such as ongoing collaborations at EU level (EEFIG) and in the G20 (G20 EEFTG). The webinar will formally launch the platform, introduce its working mode, core members, and offer an opportunity for financial institutions to jointly discuss how to bring the energy efficiency finance market to further scale. The webinar will introduce the newly launched Positive Impact investment framework for property owners and asset/investment managers. This is part of a suite of resources from UNEP FI to address the SDG financing gap and shift financing practices so that environmental, social and economic impacts are fully considered, intended and measured in investment activities. Human activities are accelerating environmental changes, notably in the form of climate change, pollution, and habitat loss. These environmental changes can lead to adverse consequences for businesses and for the financial institutions that provide services to them as the conditions for economic activities change. Financial institutions wishing to understand and assess their exposure to these risks need comprehensive and systematic information on how businesses depend on the environment and the consequences they face when that relationship is disrupted by environmental change. For this reason the Natural Capital Finance Alliance, funded by the Swiss State Secretariat for Economic Affairs (SECO) and the MAVA Foundation, has come up with tools and insights to help practitioners identify material natural capital risks and opportunities within their portfolios and integrate these considerations into financial decision making. The webinar will provide an overview of the recently launched ENCORE tool (Exploring Natural Capital Opportunities, Risks and Exposure). It also marks the official online launch of the NCFA’s latest report produced by PwC, which applies the ENCORE tool to develop a natural capital assessment framework for enhanced portfolio risk management in banks. This webinar helps financial institutions understand how to apply a holistic positive impact lens to portfolios or products for corporates with unspecified use of proceed via a recently released Model Framework. This Framework serves as a basis for a new Working Group on holistic impact analysis, which brings together financial institutions to test the framework with real cases and share learnings. The Model Frameworks are the tools through which the PI Principles are interpreted and implemented. They are developed by the PI Initiative to guide the delivery of Positive Impact financial products and for ongoing portfolio monitoring. Financial institutions can use them to develop or adapt their own frameworks. Auditors, analysts and other stakeholders can use them to verify or provide opinions on the PI nature of financial products. The Technical Expert Group on Sustainable Finance set up by the Commission in July 2018 has launched a call for feedback on EU action to develop a unified EU-wide classification system – or taxonomy – for environmentally sustainable economic activities. The call for feedback aims to help the Technical Expert Group engage with a broad range of stakeholders and experts and will close on 22 February 2019. This Webinar will provide background and guidance on the feedback process to support stakeholders and experts interested in contributing. UNEP FI has pioneered work on Positive Impact finance, and TCFD implementation for investors, banks and insurers. Hear from the leaders at UNEP FI about next steps in SDG finance, as well as in TCFD implementation, and how the bigger picture in sustainable finance is evolving. Where are we at with SDG financing? Latest UN reports (HLPF, September 2018) suggest we may not be on track overall with SDGs. UNEP FI & a range of partners believe that results-driven – i.e. impact focused – analysis needs to be consolidated and mainstreamed to meaningfully connect the private and finance sector to the SDG agenda. The Principles for Positive Impact provide a meta-framework with a holistic definition of impact to complement and promote convergence among the growing body of impact-oriented methodologies and standards. How can financial institutions better understand, assess, and prepare for climate change, across meteorological, technological, and regulatory domains? How can they do so in a forward-looking, scenario-based manner, that allows them to respond to the FSB TCFD? How are they coalescing and organising on UNEP FI platforms to jointly develop answers? UNEP FI has led several pilot-projects on TCFD implementation, and here, we share the results and outcomes. United Nations Environment Programme – Finance Initiative (UNEP FI) is a partnership between United Nations Environment and the global financial sector created in the wake of the 1992 Earth Summit with a mission to promote sustainable finance. More than 230 financial institutions, including banks, insurers, and investors, work with UN Environment to understand today’s environmental, social and governance challenges, why they matter to finance, and how to actively participate in addressing them. UNEP FI’s work also includes a strong focus on policy – by facilitating country-level dialogues between finance practitioners, supervisors, regulators and policy-makers, and, at the international level, by promoting financial sector involvement in processes such as the global climate negotiations.